Our company has devoted to making various paper machines and pulping equipments for four decades, so we are more professional in this industry. besides the Paper Recycling Living Paper Machine, we supply different kinds of paper machine such as Kraft Liner Board Machine, Corrugated Paper Machine, High-grade Cultural Paper Machine and etc. 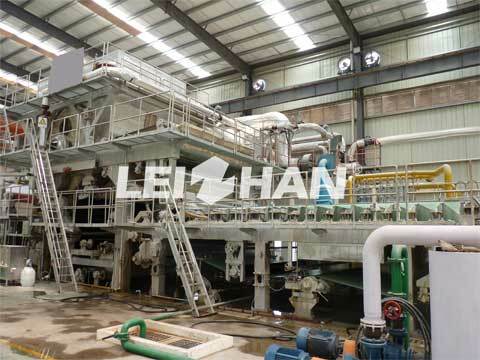 the main features of Paper Recycling Living Paper Machine are as follows. Part one: headbox. the hydraulic headbox controls and stabilizes the sizing head and the consistency of the slurry by adjustingand controlling the feed pressure and the opening of the upper and lower lip-board of the headbox. Part two: wire section. single wire, the main components including: chest roll, forming plate, dewatering plate, vacuum box, volt roll, drive roll, guide roll and frame. Part three: press section. divided into main press and roller press. the roller of the roller press shares an upper blanket with the main press, both of their pressurization method are the corrugated pneumatic tire pressurization. Part four: drying section. contains two big cylinder, all drive alone. Part five: coiling section. pneumatic horizontal reel, its pressurized way is cylinder pressurization. If you are interested in this Paper Recycling Living Paper Making Machine, welcome to contact with us. we will supply specialized machine for you.